Thanks to the crew at ZeHosting for the diligence and hard work. I don't know when I decided Selkie is a sleep-drooler, but... yeah, totes a sleep-drooler. Damn it Todd, how do you not realize what that news report is really about? I’m expecting him to put two + two together in Friday’s comic. Sorry, I meant to reply to Andrew. I’m guessing he just assumed that but didn’t say anything. I’d assume it’s more likely an irritant than an acid, so drooling down her face and ending up with a little bit on his pant leg (also depending on the fabric) he should be just fine, or only display minor symptoms. Nowhere near as bas as when he got direct contact from her kisses. Since they’ve been living together for a while, maybe he’s developing a resistance to it? If Indian snake charmers can deliberately expose themselves and their children to small amounts of venom to become immune to bites, maybe the same can happen with Selkie’s saliva? If it’s topical it seems like touching her closing on a regular basis would possibly do the trick. Typo alert: “useage” should be “usage”. Is it merely a coincidence that the resonance display forms the Breath symbol from Homestuck? 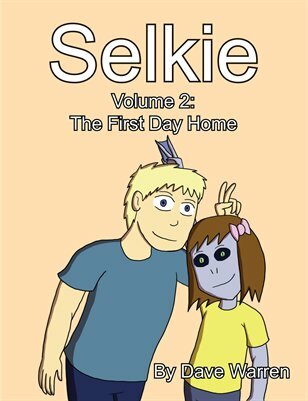 Is it merely a coincidence that you are apparently a fan of Selkie, Gunnerkrigg Court, AND Homestuck? I see you comment on every single page. You are an awesome person. It’s a coincidence, yeah. I’ve never been able to get into Homestuck. And Todd: she is your daughter. She also might be an illegal immigrant (since I think Plo Quar brought her to the humans without going through the MIBs), and she is a member of a nigh-extinct (and possibly persecuted) clan, but she is your daughter. I think the “what are you” was directed at the *bow*, not at Selkie. Poor Todd. First she snotted on his shirt https://selkiecomic.com/comic/selkie216/ and now she slobbers on his pants. Kid’s hard on the wardrobe. I think he’s asking “What are you?” to the bow—not Selkie. Once it was “swamp gas”/”weather baloons”/”the planet Venus”, now it´s “illegal fireworks usage”… and when the sarnothi begin showing up in person au masse, it´ll be “Cthulhu mythos cosplay event”, I assume? Thank you, I’ve sent it forward. This, this is what I’ve been waiting for. Why was Selkie abandoned but given one last mysterious connection to wherever she came from? (Sarnoth, apparently, but we still don’t really know the where and why.) Finally we’re getting to the point of asking the big questions. Todd is asking exactly the riight questions here. What I don’t know is, what are the answers going to turn out to be? Of course she’s a sleep drooler. She’s probably dreaming about Fishies!!!! Sleep-drooler Selkie may be but Crooks appears to be a teleporting cat! Where’d he go? Where any cat goes when he doesn’t feel like sticking around. What’s the white thingie over Selkie’s head in panel 1? Looks kinda like a wolf in sheep’s clothing toy. Oh, and how could they tell the usage of illegal fireworks raised? Did the official sales statistic skyrocket? That’s Crook, the family cat.